It’s your turn to wear the hat of “reunion organizer.” Think about this way: at least you can cover the hole in your head for taking on the job. You won’t need a Prozac drip or a copy of 100 Excuses for Every Occasion, if you do one simple thing. When you’ve nailed down the event’s location, call the area’s Convention & Visitors Bureau (CVB). From a general standpoint, the CVB has endless information that can impact planning activities for your reunion: calendars of upcoming events, what to do, where to go and details outlining who else will be there when you want to go. 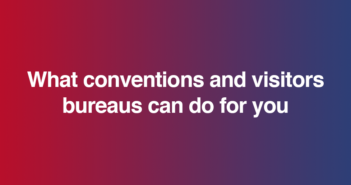 There may be large, raucous conventions with which you’d rather not compete for space or parking, while at other times there might be events that might please some of your members. Milwaukee, Wisconsin, has an enviable summer schedule of festivals on the Lake Michigan shore of interest to countless reunion groups. Irish Fest, for example, actually hosts family reunions and announces in advance who will be honored. The Williams Family Reunion scheduled their banquet in Milwaukee on a Friday so members could enjoy Saturday evening at African World Festival. Ask for a festival calendar from the CVB. Roseann Lugar, Convention Sales Manager of Virginia Beach Convention & Visitor Development, says that her office receives calls from reunion organizers when they are at the beginning stages of planning. “We take information such as the Family Reunion name, dates you are looking for, number of people who will be attending, number of hotel rooms you’ll need, and any other need you may have,” she explained. “The information is then sent out to ALL hotels in Virginia Beach.” Imagine having hotels contact you with availability and rates instead of the other way around! Then, the CVB sends reunion organizers Virginia Beach brochures with information about family fun: transportation, events, attractions including those beyond the beach in the Hampton Roads region, dining options and locations for picnics. “When we are advised that the family reunion is confirmed at a Virginia Beach hotel, we put together a supply of attraction brochures, coupon books and Virginia Beach pins,” Lugar said. (800) 700-7702. The beach attracted the Feaster-Lyles family to choose the city of Virginia Beach to host their 2000 reunion. “When we first took on the monumental task, I contacted the convention and tourism department via e-mail and Roseann Lugar sent my information to possible site hotels that contacted me via regular mail,” explained Cassandra Feaster Hamilton. “We chose The Founders Inn and the staff was most accommodating from the initial phone call to the closing event. We received first-class treatment and family members praised the hotel site in a survey conducted at our last event,” Hamilton said. The 100 family members in attendance ranged in age from a few months to 89 years old. The family’s Friday activities are usually planned by the host cities. (In the past, they have ranged from a Baltimore Orioles game to an all-you-can eat seafood dinner followed by a boat cruise with just family members.) “During the 2000 reunion we provided cloth tote bags inscribed with the family theme (IGNITING OUR FUTURE GENERATIONS) filled with many items provided by Roseann Lugar’s staff – attraction brochures, coupon books, lapel pins, and plastic bags,” Hamilton explained. The CVB also included a letter from the Mayor welcoming the family to the area; the letter was included in a souvenir booklet. The family took in a seafood buffet at Captain Georges Seafood Restaurant, an African-American Heritage Tour of the Hampton/Newport News, Virginia, area and a boatride on the Carrie B out of Norfolk, and used the Cabana Room at the Sheraton Hotel for those who wanted to spend the day at the beach. Will the Washington DC CVB measure up for the 2002 Feaster/Lyles reunion? Even hopping malls are moving into the business of luring, lodging and entertaining family reunions.Whether your group spends an afternoon shopping or builds a trip around bargain-hunting, the statistics are staggering: among domestic travelers who travel 100 miles or more away from home, shopping is the number one vacation activity, according to the Travel Industry Association of America (TIA). Close to Chicago’s O’Hare Airport, the Greater Woodfield area is home to the nation’s fifth largest shopping mall. The number one tourist attraction in the state of Illinois, Woodfield lays claim to well known department stores, chic boutiques, one-of-a-kind merchants and kid-friendly retailers including the Discovery Channel Store and NASCAR Silicon Motor Speedway. The Harris/McGhee family meets every other year, and 2001 found about 120 family members descending upon the Greater Woodfield area. Family member Harold Green works in Schaumburg, home of the mall. He was working feverishly to coordinate the reunion. “I had chosen the hotel, but all of a sudden, everything fell apart,” Green explained. “I pass by the CVB on my way to work everyday and thought, ‘I wonder if they could help?’” Green gave the CVB a price range and within two weeks the effort produced a list of hotels, meeting rooms, detailed area attractions, and transportation to and from Chicago for a night at Navy Pier. The CVB made sure the banquet hall provided a handicapped-accessible area and made arrangements for a bus with a lift for physically challenged family members. “They had a package for everyone,” Green continued, “that included a map of the area, places to eat and little souvenirs. Everyone had a great time.” With its world-class museums, theater and arts communities, magnificent lakefront and endless festivals, the Chicago area is a family reunion paradise. Staying in the Woodfield area means you can have a big city adventure one day, but pay smaller town prices for lodging and meeting space. The 2003 Harris/McGhee reunion will meet in Orlando. Every family dreams of at least one Orlando, Florida, reunion. The Orlando/Orange County CVB helps with ideas and attractions such as Walt Disney World, Busch Gardens Tampa Bay, Cypress Gardens, Universal Studios and Kennedy Space Center. The CVB offers a meeting planner website which can help with many details of your early planning steps. For example, there is a virtual “Request for Proposal” which is sent directly to hotels and meeting support services. Other CVB services — such as value rates, links to member sites and other services — are also available at www.orlandoconvention.com. Call 407-363-5847 and ask for the 2004-2005 Meeting Planners Guide.